For all breeds especially those requiring a harsh - to - touch finish. 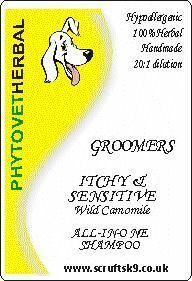 This product is a Handmade, 100% Herbal, Hypoallergenic Shampoo with Conditioner. It is a detergent - free shampoo which will not strip the coat of its natural oils. It is concentrated and can be diluted up to 40:1. Ideal for all puppies and fine coated breeds. This product is a Handmade, 100% Herbal, Hypoallergenic Shampoo with Conditioner. It is a detergent - free shampoo which will not strip the coat of its natural oils. It is concentrated and can be diluted up to 40:1. Suitable for all breeds in aiding the erradication of fleas and other parasites. This product is a Handmade, 100% Herbal, Hypoallergenic Shampoo with Conditioner. It is a detergent - free shampoo which will not strip the coat of its natural oils. It is concentrated and can be diluted up to 40:1. 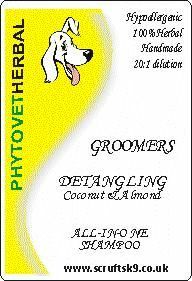 PhytovetHerbal Coconut & Almond shampoo is specially formulated for dogs with dry and flaky skin. 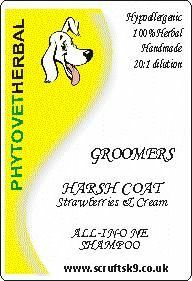 This product is a Handmade, 100% Herbal, Hypoallergenic Shampoo with Conditioner. It is detergent-free and will not strip the coat of natural oils. It is concentrated and can be diluted up to 40:1. Honeysuckle is a shampoo for general use with a delightful floral fragrance. This product is a Handmade, 100% Herbal, Hypoallergenic Shampoo with Conditioner. It is a detergent - free shampoo which will not strip the coat of its natural oils. It is concentrated and can be diluted up to 40:1. Dirty Dog shampoo gives enhanced cleaning for heavy soiling and staining, leaving your dog smelling sweet and refreshed. This product is a Handmade, 100% Herbal, Hypoallergenic Shampoo with Conditioner. It is a detergent - free shampoo which will not strip the coat of its natural oils. It is concentrated and can be diluted up to 40:1. Bilbury and Jasmine shampoo has deep cleansing and moisturerising qualities and aids dogs with dry skin. 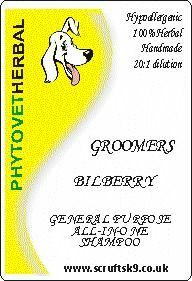 This product is a Handmade, 100% Herbal, Hypoallergenic Shampoo with Conditioner. It is a detergent - free shampoo which will not strip the coat of its natural oils. It is concentrated and can be diluted up to 40:1. Blacker than Black Shampoo is a fantastic product for black coated breeds. The formula has been devised for breeds such as Newfoundlands to help enhance the coat. It is also great for maintaining the coat /skin condition. The inclusion of Essential Oils is especially helpful in soothing and moisturising sensitive skin. As with all of our shampoos we provide the best possible product which are made out of the highest quality natural ingredients. This product is a Handmade, 100% Herbal, Hypoallergenic Shampoo with Conditioner. It is a detergent - free shampoo which will not strip the coat of its natural oils. It is concentrated and can be diluted up to 40:1. Whiter than White shampoo is a fantastic product for dogs with white and cream coats. It is also great for maintaining the coat / skin condition. The inclusion of essential oils is especially helpful in soothing and moisturising sensitive skin. As with all our shampoos we provide the best possible products made from the highest quality natural ingredients. This product is a Handmade, 100% Herbal, Hypoallergenic Shampoo with Conditioner. It is a detergent - free shampoo which will not strip the coat of its natural oils. It is concentrated and can be diluted up to 40:1. Tea Tree Shampoo produces a gentle but complete cleansing action deep into the coat, helping to sooth the skin and repel ticks, fleas and mites. This product is a Handmade, 100% Herbal, Hypoallergenic Shampoo with Conditioner. It is a detergent - free shampoo which will not strip the coat of its natural oils. It is concentrated and can be diluted up to 40:1. EPO is particularly suitable for red and brown coats.lt is also for all dogs with sensitve skin and coat problems. It is anti-bacterial and non irritating and if bathed regularly helps to attain high levels of EFAs. 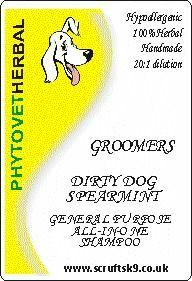 This product is a Handmade, 100% Herbal, Hypoallergenic Shampoo with Conditioner. It is a detergent - free shampoo which will not strip the coat of its natural oils. It is concentrated and can be diluted up to 40:1. Jasmine shampoo has an elegant floral fragrence which soothes and moisturises the skin. This product is a Handmade, 100% Herbal, Hypoallergenic Shampoo with Conditioner. It is a detergent - free shampoo which will not strip the coat of its natural oils. It is concentrated and can be diluted up to 40:1. 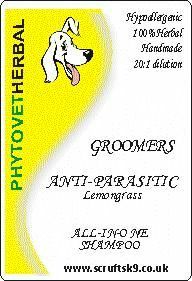 This healing Lavender dog shampoo will purify and is great for skin infections and other skin problems such as canine dermatitis. It is also soothing and relaxing. Contains only the very best Lavender Essential Oils as well as other essential oils. This product is a Handmade, 100% Herbal, Hypoallergenic Shampoo with Conditioner. It is a detergent - free shampoo which will not strip the coat of its natural oils. It is concentrated and can be diluted up to 40:1. 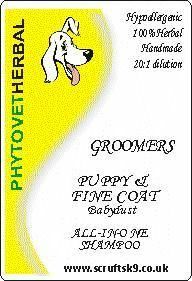 This product is a Handmade, 100% Herbal and Hypoallergenic Shampoo.It is detergent - free shampoo which will not strip the coat of it's natural oils. It helps heal wounds, cuts, hot spots and itchy skin. Apply direcctly to coat and skin, massage till a small amount of suds show, leaving coat for a few minutes and then rinse well. Repeat every 2 or 3 days untill symptoms subside. Our Melon Conditioner has been formulated to moisturise dry and damaged coats. It nourishes the coat and has anti-static qualities. It leaves the coat silky and shiny with a delightful fresh fragrance.